Tim Nein is the President and CEO of Verdun Oil Company and has 20 years of experience in the oil and gas industry. Prior to forming Verdun, Mr. Nein was employed by Hilcorp Energy Company and served as the Area Manager (ATL) for the Northeast U.S. Region and was responsible for developing the Utica Shale with a gross operated budget of over $300 million for both 2014 and 2015. Prior to that, Mr. Nein was the Director of Hilcorp’s New Ventures group and was responsible for the evaluation and entry recommendations for resource plays across the Lower 48 and Canada, highlighted by the company’s 2009 entry into the Eagle Ford Shale and 2011 exit via divestment to Marathon Oil Company for $3.5 billion. Mr. Nein started his career as a Production and Reservoir Engineer in Midland, TX and spent over six years working the various sub-basins of the Permian Basin for Texaco and Conoco followed by three years in the Gulf of Mexico working as Reserves Manager / Engineer for Bois d’Arc Energy. Mr. Nein received a BS in Chemical Engineering from the University of Wyoming and a Master of Business Administration from the University of Texas-PB. Jason LaGrega is the Chief Operating Officer of Verdun Oil Company and has 21 years of experience in the oil and gas industry. Prior to forming Verdun, Mr. LaGrega was employed by EOG Resources Inc and served as the Drilling Manager in the San Antonio Eagle Ford region where he drilled in excess of 2,000 wells and helped pioneer new drilling techniques which have become industry standard practice today. In addition to his extensive experience in the Eagle Ford Shale, he spent five years in the Permian Basin as part of EOG’s Midland Division. During his tenure in the Midland Division, Mr. LaGrega drilled a wide variety of wells including deep, HPHT gas wells, multi-laterals in the Devonian Chert, vertical wells in Midland Basin’s Sprayberry and Wolfcamp trend, and also cased-hole horizontals targeting the Delaware Basin’s many unconventional reservoirs. Mr. LaGrega started his career as a Production and Completion Engineer in Midland, TX for Texaco where he optimized operations and production across a multitude of different asset types from deep, depletion-drive gas reservoirs to primary, secondary and tertiary-recovery oil reservoirs. After the merger between Chevron and Texaco to form ChevronTexaco, Mr. LaGrega served as a Reservoir Engineer on the Asset Development Team before eventually transferring into ChevronTexaco’s drilling department. Mr. LaGrega received a BS in Petroleum Engineering from the University of Texas at Austin after spending two years at the United States Military Academy at West Point. Daniel Savitz is the Chief Financial Officer of Verdun Oil Company and has 18 years of experience in the finance and oil & gas industries. Prior to forming Verdun, Mr. Savitz was Chief Financial Officer of Elite Compression Services, a privately-held provider of contract natural gas compression services. Prior to Elite, he was employed by Hilcorp Energy Company in a variety of roles covering capital markets, budgeting, risk management, acquisitions & divestitures and other related responsibilities. Before joining Hilcorp Mr. Savitz worked at Goldman, Sachs & Co. in the E&P Capital group, executing principal investments across the capital structure in upstream and midstream energy companies, after beginning his career as an investment banking analyst with RBC Capital Markets. Mr. Savitz is a licensed CPA in the state of Texas and has a Bachelor of Business Administration and a Master in Professional Accounting from the University of Texas at Austin. Will Rider is the Vice President of Land & Business Development of Verdun Oil Company and has 19 years of experience in the legal and energy industries. Prior to forming Verdun Oil Company, Mr. Rider was employed by Hilcorp Energy Company as Business Development Manager and as a Landman primarily covering the Eagle Ford Shale. Prior to Hilcorp, Mr. Rider worked for Atinum E&P as the Supervisor of Land & Legal. Before joining Atinum, Mr. Rider worked as an associate attorney for the firm of Bienvenu, Foster, Ryan & O’Bannon, managing clients’ fee minerals and commercial leasing as well as litigating real property damage and oil & gas operator disputes. Will is a licensed attorney in the state of Louisiana and has a Bachelor of Arts and a Juris Doctorate from Louisiana State University. Martin Perez is the Vice President of Engineering for Verdun Oil Company and has 19 years of experience in the upstream oil and gas industry. Prior to forming Verdun Oil Company, Mr. Perez was a Development Supervisor for ConocoPhillips where he managed a team actively drilling wells and overseeing assets in the Permian Basin with a recurring capital budget of $50 to $100 million. Prior to ConocoPhillips, Mr. Perez worked for Devon Energy as Reservoir Engineer for South Texas assets where he evaluated, proposed and drilled vertical and horizontal prospects and had oversight of a $60 million development budget. He began his career in field operations for Baker Hughes in South Texas. Martin holds a Master of Petroleum Engineering from Texas A&M University. Mark Stephenson is the Vice President of Geology of Verdun Oil Company and has 38 years of domestic and international oil and gas exploration experience in various onshore and offshore basins. Prior to joining Verdun Oil Company, Mr. Stephenson was employed by Hilcorp Energy Company as New Ventures Geology Manager where he worked directly with Mr. Nein. Together, they were responsible for the technical evaluation and acquisition recommendations for all of the major unconventional plays in the US lower 48 and Canada including the Eagle Ford, Niobrara, Wolfcamp, Woodford, Marcellus, Utica, and the Duvernay. The highlight of that team was the identification, acquisition, and eventual divestiture of Hilcorp Energy’s Eagle Ford Shale position in Karnes, Dewitt, and Gonzales Counties to Marathon Oil Company for $3.5 billion in 2011. Prior to Hilcorp Energy, Mr. Stephenson was Senior Geologist, then Exploration Advisor at Samson for International, Gulf Coast and Offshore exploration activities. Mr. Stephenson has a BA in Geology from The University of North Carolina-Chapel Hill. To be the standard against which other E&P companies are measured in terms of operational efficiency, creativity, decision making, corporate responsibility, and profitability. Verdun’s Mission is to bring together a top-tier group of motivated employees focused on identifying, acquiring, and optimizing the recovery of oil and gas reserves at an industry-best cost basis while maximizing the benefits to our employees, landowners, and the communities where we operate. A rising tide lifts all boats: company, employee, landowner, vendor, and community. Best-in-class performance requires both urgency and good decision making. A successful, sustainable business cannot survive the test of time without both. Continuous improvement is not only possible, but necessary. With industry-leading experience evaluating and developing unconventional assets across the country, Verdun has strategically focused its efforts on one of the most prolific and accessible regions in the world: The Eagle Ford and Austin Chalk Trend of South Texas. The Company owns over 25,000 net mineral acres across the Eagle Ford trend (located in LaSalle, Live Oak, McMullen, Dimmit, DeWitt, and Gonzales counties) in addition to 60,000 net acres in the Austin Chalk trend (located in Washington and southern Burleson counties). The company currently operates 180 wells and produces over 20,000 net boepd. After executing a very effective and efficient drilling campaign with 17 new wells brought on line in 2017 and 25 wells in 2018, the Company plans to increase that number to 36 new wells in 2019 on existing acreage. Utilizing its proprietary “artillery frac” design, it intends to unlock value across both plays and produce its commodity directly into the Texas Gulf Coast market and premium pricing. The company expects to exit the 2019 calendar year at a stable production rate in excess of 30,000 net boepd, giving it a cash flow platform to pursue a multitude of various growth options. At Verdun, we believe that good business not only means being a good operator, but also a good neighbor, community member, and steward of the environment. We believe that it is our responsibility to operate at Optimal Efficiency, a level of efficiency seldom achieved by others. This ideal of Optimal Efficiency is all encompassing and translates well beyond first-line costs. It means that we are maximizing the recovery of resources for the benefit of our landowners and communities, while at the same time eliminating both the health and safety risks to our stakeholders and the environmental impact caused by spills and releases. We believe that Optimal Efficiency pertains to all Operational, Health, Safety, Environmental and Corporate Responsibility measures. Verdun Oil Company eclipsed the 20,000 net boepd milestone, while building an inventory of 16 DUC’s (and counting) that are expected to come on line between March and June of 2019. Verdun Oil Company today closed on a contiguous block of 6,318 gross / 5,460 net acres and 850 net boepd located in Karnes and Live Oak Counties. This acquisition brings with it 22 producing wells, 2 state-of-the-art central facilities, a complete field gathering system, and 71 future greenfield drilling locations. The company now operates more than 160 horizontal wells and produces in excess of 12,000 net boepd. Verdun Oil Company announced the signing of a Purchase and Sale Agreement (PSA) with a private company to acquire additional HBP assets located in the matrix porosity trend of the greater Giddings Austin Chalk field. This acquisition increases Verdun’s Austin Chalk position to 60,000 net acres and complements the company’s strategy of coring up contiguous blocks of high-quality acreage allowing for efficient, long horizontal length development. Verdun Oil Company today closed on 2210 net acres (81% NRI) of non-producing leasehold located in the oil window of McMullen County. This acquisition gives the Company 27 efficient greenfield locations allowing for an average horizontal length of 8050 ft.
Verdun Oil Company today closed on 2700 net acres and 1250 net boepd in Live Oak County, immediately adjacent to existing Verdun leasehold and production. Verdun now operates 130 wells with more than 55,000 net acres of leasehold in the Eagle Ford and Austin Chalk trends. 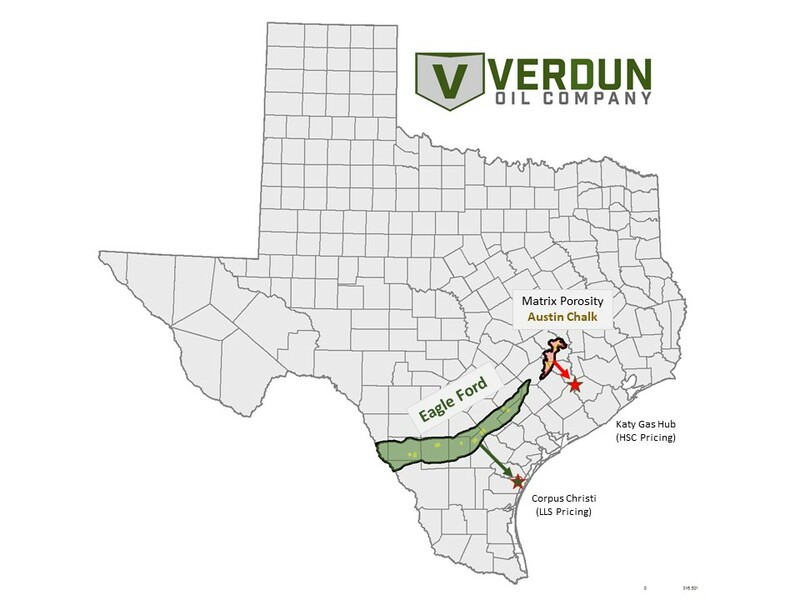 Verdun Oil Company today announced that it has signed a Purchase and Sale Agreement (PSA) to acquire an additional assets within the Eagle Ford trend. This transaction is set to close on October 1, 2017 and will increase the Company’s acreage position in the Eagle Ford and Austin Chalk trends to over 45,000 net acres. The Company has TD’d its 12th Eagle Ford well at a measured depth of 21,500 ft and a true vertical depth of 12,200 ft, further demonstrating its ability to efficiently drill and complete long laterals and maximize the recovery of reserves under lease. To date, the Company’s drilling program has delivered an average lateral length of 9,000 ft, with the longest coming in at 11,000 ft.
Verdun expects to have completed and turned in line a total of 17 wells by September 2017. Verdun Oil Company today announced that it completed its third asset acquisition consisting of 1,900 net acres and 600 net boepd in DeWitt and Gonzales Counties. This acquisition illustrates the Company’s ongoing commitment to acquire and develop the highest quality acreage in the Eagle Ford Trend. Verdun Oil Company spud its first two Eagle Ford wells, each with an anticipated lateral length of over 9500 ft, on properties purchased just three days earlier. The company plans to complete the wells with its proprietary “artillery frac” immediately upon conclusion of drilling operations. Verdun Oil Company today announced that it completed the acquisition of over 11,000 net acres and 2,000 boepd from an undisclosed party, increasing its acreage position in South Texas to approximately 15,000 net acres. Verdun Oil Company LLC (“Verdun”) has been formed with a $250 million equity commitment from management and EnCap Investments, L.P. Verdun will focus on acquiring existing oil production and developing new plays in the Mid-continent and Gulf Coast regions. Verdun is led by Tim Nein and managed by a team of experienced professionals with more than $10 billion in transaction experience. The team has also drilled and operated in excess of 1,600 horizontal wells across the Gulf Coast (Eagle Ford), Permian Basin, Appalachian, and Denver-Julesburg Basins. *Please include “Verdun” in the subject line and Owner Name & Owner Number in the body of your email.